With Bella Couture®, your gift packaging and card needs are taken care of. Your gift will be delivered in distinctive Bella Couture® labeled fine gift packaging and box with plush interior padding with our Bella Couture® distictive logo accenting the ensemble, rich red and white leather gift box or our finely polished lacquered wooden and leather gift box. Elegant enough to skip the wrapping paper, and we'll even enclose a free gift card with your personal message. Simply select the "Gift Wrap" option for each item you order during checkout, we'll take care of teh rest. So, whether you order a gift to give to a friend personally, or have us deliver your gifts directly, your recipient is sure to be impressed. Are you sending a gift and need to add a Gift Message to your order? It's easy to do and it's FREE. To send a gift card including a typed gift message from you, to your gift recipient, look for the "Click to Add Free Gift Wrap & Gift Card Message" link in the shopping basket once you have added the item to your cart. Then enter a personal message which will be printed on an elegant distinctive card and tucked in with your gift. At Bella Couture®, during checkout, you can ship your gifts to multiple recipient locations all within one transaction. During checkout you will see options to ship to multiple gift recipient addresses for each item being ordered. 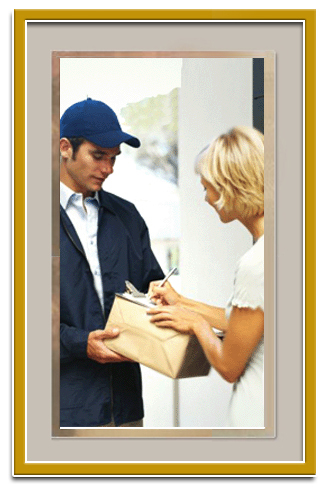 Simply fill in the address you want each item to be shipped to and we will take care of the rest. At Bella Couture® we make gift giving easy! Remember to keep your Bella Couture® gift packages well hidden. As, once an elegant Bella Couture® gift package is notices, it is very difficult to keep it from being opened. 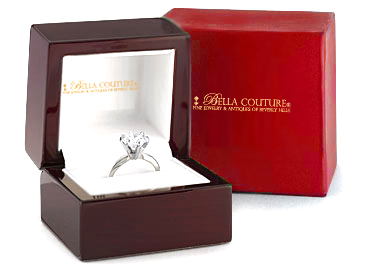 All diamond purchases and engagement rings set by Bella Couture® are presented in a finely finished lacquered wooden ring box. 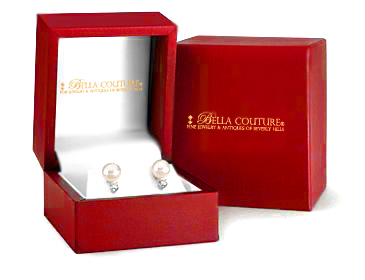 Most other jewelry comes carefully arranged in a designer Bella Couture® label gift box, many will also include a plush velvet pouch tucked inside the distinctive Bella Couture® gift box.